Dr. Dickey (1893-1959) was an advocate for health care and civil rights in Taylor and was recognized for his tireless efforts to improve the lives of African Americans there. He created a vaccination program to fight a typhoid fever outbreak that occurred in 1933 and established a prenatal and venereal disease clinic. Additionally, Dr. Dickey worked with others in Taylor to develop a community center and recreational facilities for young African Americans. In 1953, Dr. Dickey was honored as Taylor’s Citizen of the Year and as General Practitioner of the Year by the Lone Star State Medical, Dental, and Pharmaceutical Association. In 1997 Dr. Dickey’s house was dedicated as the future home of the Dickey Museum. In June 2007, the Blackshear/O.L. Price Ex-Student Association along with the Williamson County Historical Museum and the Williamson County Historical Commission unveiled a Texas Historical Marker at the site. 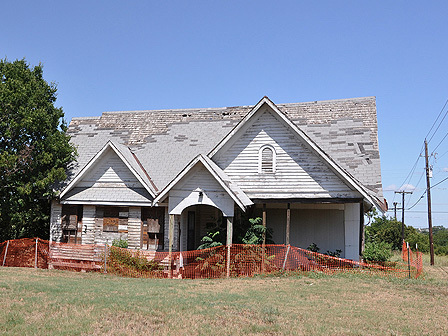 It is estimated that the Dickey house needs $100,000 in structural and roof repairs. UPDATE: In January 2016, the Blackshear/O.L. Price Ex-Students Association hosted a ground-breaking ceremony for foundation repairs as part of plans to convert the house into a museum for African-American history and art.